Generally a tandem axle truck will carry approximately 12.75 tonnes. An average truck and trailer unit will carry from 33.00 tonnes. We have access to larger trucks that can carry over 60 tonnes, however these are not suitable to suburban streets and tend to be used for point to point deliveries to storage facilities with major road access. There are a multitude of truck and trailer combinations available, we try to match the right cartage method to the destination. Factors we have to consider are access, individual road conditions and mass limits, and bridge weight restrictions. You can collect ex bin using your own cartage provider. No small vehicles. 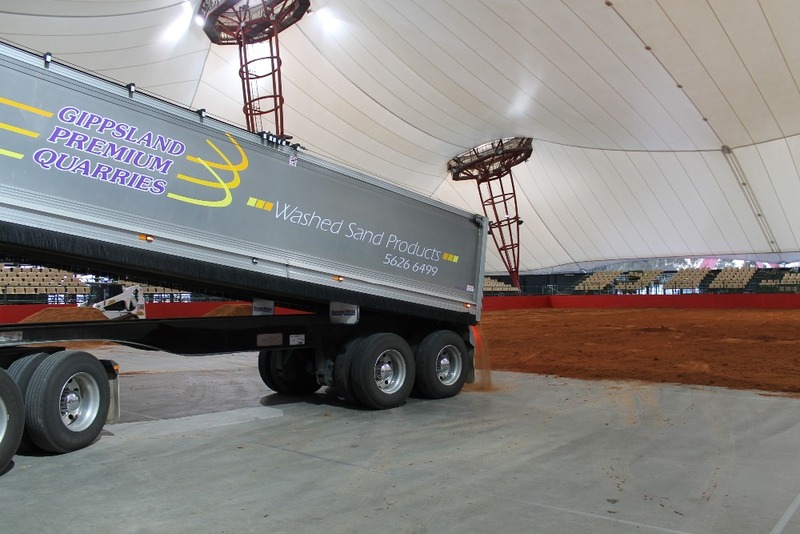 Where ever possible we try to deliver our sand in Truck and Trailer loads. If this is not practical we can deliver in individual truck units. We charge our stock out in full truck loads, we do not deliver part loads. If there is any doubt over access we will send the first load in a truck unit and let the driver decide if the site can accommodate a trailer. If possible the driver will spread the sand while onsite. Truck and trailer units are larger than you may think. They require a lot of room to manoeuvre and tip off. Overhead clearance including trees and power lines. Turning circles both into/out of your delivery point and within your delivery point. Locks and security. Are you required to be onsite to accept delivery? Troughs, gates, fences and drains. Rough, soft and uneven ground. When we have your details we check access via the NearMap service, or if we have a representative in your area we will check the site in person and take measurements and pictures to aid the drivers. We try to work as closely as possible with our customers, the more information you can provide to us the better. If we are unable to deliver product because of access issues the cost of cartage will be passed on to the customer, along with waiting time if applicable. Our Truck drivers are sub-contractors, we do not negotiate on cartage rates.